Mondays. Ugh. I really live for weekends nowadays especially with this freakish cold weather here in Manila. 24 degrees in a tropical country is rare. I just want to be snuggled in bed and sleep all day like a hibernating bear. This morning, a scent wafted from the kitchen and woke me up – bacon. We love bacon in this family but I had to do a quick note to self before going back to sleep: Remind Yaya (the helper) not to keep cooking bacon for Bea for her lunch even if she requests it. I try to inject some nutrition in this family. The operative word here is TRY. In my head, whatever lack of nutrition my child has, her multi-vitamins will take care of it. Well, that’s how I try to make up for my feeling of inadequacy and I think some other mothers do. Ads on TV also have something to do with that but that’s another story. My daughter’s definition of eating vegetables is eating the lettuce from a Big Mac. Though she’s starting to eat carrots and others..slowly (and I’m proud of that feat already). So, her daily lunch box is filled with food she likes eating. Nothing breaks a mom (and the yaya’s) heart than seeing a half eaten lunchbox. You know what else makes me feel inadequate? Bento Moms. There, I said it. How they can do these wonderful works of art?! The effort, the creativity, the number of ingredients stocked up in the kitchen! If I were a kid with a bento mom, I wouldn’t even eat my lunch! I would show it off at school then frame it until it turns into a petrified version that I can keep forever! 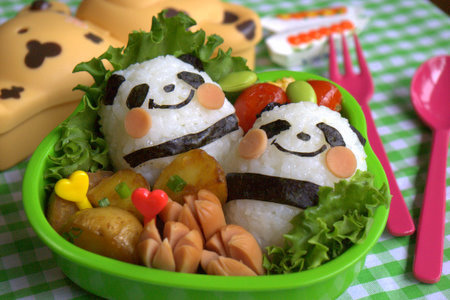 How can you eat such cute, smiling innocent pandas?! This Bento Mom phenomenon makes the rest of us feel like underachievers and I hope my child will not correlate the extensive artwork lunchbox to how much I love her. I really hope not. Am I the only one feeling this strange insecurity?! Pop that vitamin,child. There is not enough nutrition in that chicken nugget you’re eating. Chicken nugget stars, shapes and animals is the most creative lunch my daughter can have in the meantime. That and maybe alphabet soup. 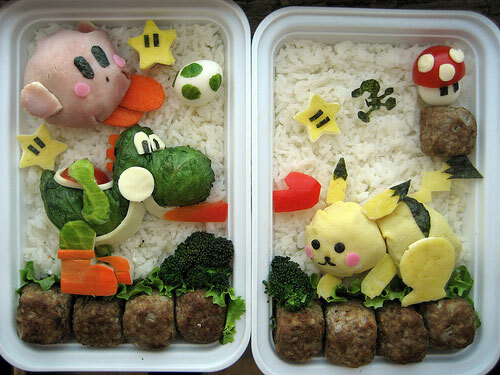 Some Bento Moms also make lunches for their husbands. 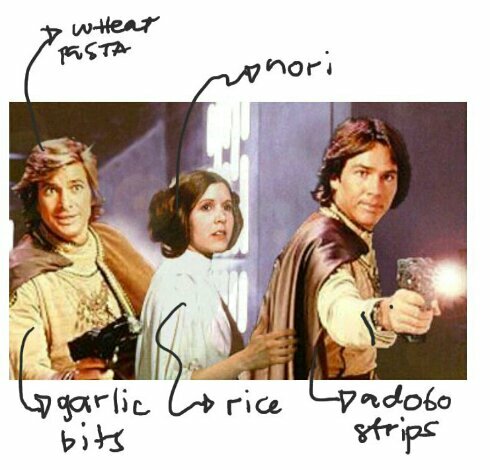 How awesome would it be to open the lunch box your wife lovingly made and see the entire cast of Star Wars complete with a Battle Star (batteries not included) in the board room. Perfect blend of protein and carbs. All your officemates would die of envy as they eat their 2-piece chicken meal from KFC. The lunch possibilities are endless, actually! 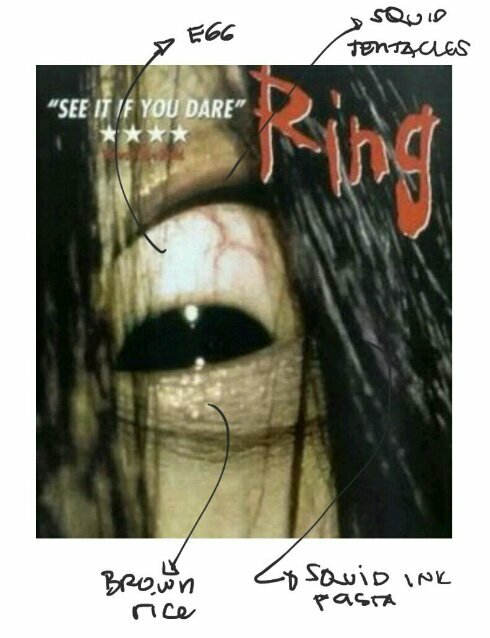 You can have Sadako coming out of the lunchbox too! Awesome! 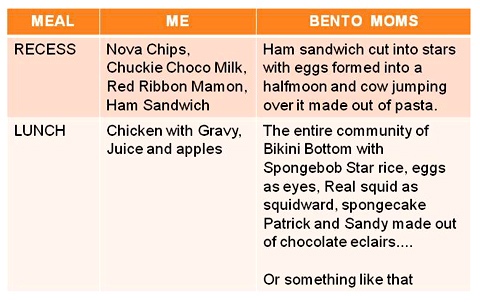 I wish I were a Bento Mom but I can’t. It’s hard enough to keep track of the meals in our house and planning the menu to make sure the people in the household are not malnourished. I will flush down the feelings of inadequacy (like the bodily remnants after a meal of a beautiful bento box) and keep trying to do that. I can’t be a bento mom but I’ll be the mom who will keep trying. I can assure you that people who make bento don’t do it to make anyone feel inadequate. And you shouldn’t feel inadequate. We do it because we / or the kids enjoy it.